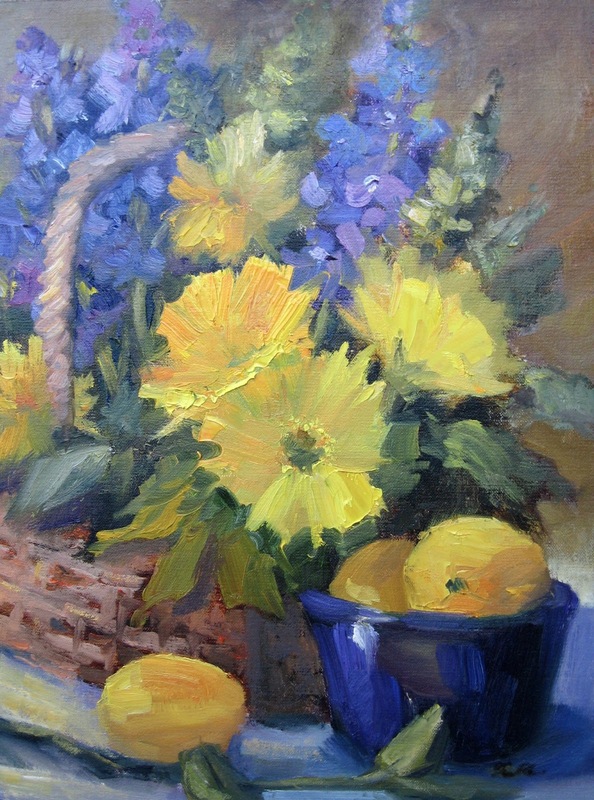 I painted this one awhile ago, but thought the colors and basket felt fitting as we are on the cusp of Spring. Best wishes to all for a Happy Easter, Passover and Welcome to Spring! Needed a painting for a special project I'm working on in a 8 x 20 format. This reminds me of many places I've seen in Italy, but it doesn't really exist. I made up this fantasy neighborhood from memories of small villages I've visited. I caught a beautiful sunset over the Arno river one evening while in Florence and finally decided to paint it. Florence( also known as Firenze) is usually one of the places where I spend a few days before my painting workshops in Tuscany. There is so much history and art in this amazing city. I recently learned that Florence was originally named Fiorentia by Caesar. The word means "flourishing". Little did he know that centuries later, the city would be flourishing as a major art center contributing to the Renaissance. Lake Como Dreams... and a 2 year anniversary! I've been working on this larger painting for a couple of weeks. It's a view of Varenna from Lake Como, in northern Italy. 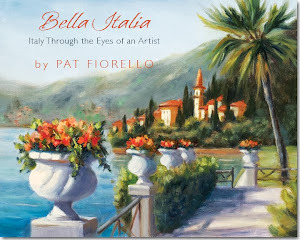 I plan to use it for the cover of my forthcoming book, "Bella Italia, Italy Through the Eyes of an Artist". The book is currently in development, with layout being finalized and photo's being optimized for the printing process. Will keep you posted as I learn more about timing for it's release. I'd also like to acknowledge today is the 2 year anniversary of this blog, "Art Elevates Life". I have over 300 posts to date- which I can hardly believe since my first attempt at a blog the prior year lasted for a grand total of 2 days. The reason is, the first time in 2010, I started the blog was because I thought I "should" do it and "should" is never motivating for long." Should" quickly turns in to a burden or obligation and then you give up. The second time I started the blog, I changed my context from "I should do it" to this could be a platform for sharing my enthusiasm for art and inspiring people to participate in art more (whether as an artist, student, patron, collector or any form of appreciation), as a contribution to enrich their lives. Sharing, inspiring contributing, enhancing- now those are a lot more exciting and enlivening than "should". so as they say, context is decisive. The WHY you are doing something is as important, if not more important than what or how you are actually doing it. That seems to apply to many areas of life. Thank you so much for participating in this conversation with me. I appreciate your interest, support and feedback. Thank you for appreciating art and helping to share that enthusiasm with others, because I truly believe "Art Elevates Life". and Happy St. Patrick's Day too! Been working on some larger paintings lately which have been taking more days to paint, so haven't been posting as much, but don't worry I'm still painting away. Finished this one this week. Memories of Bellagio, which is a beautiful town on the shore of Lake Como, Italy known as the "Pearl of Lake Como". It's an absolutely enchanting, romantic place. A small town which seems to be mostly shops, hotels and restaurants and a few gardens near the lake shore area surrounded by lush foliage and with the alps in the distance. From there it's a short boat ride to Varenna on the other side of the lake - another charming place. And you can hop on and off the boat at several towns up and down the lake. If you haven't been there yet, this might be one for your "bucket list". It's just a one hour train ride north of Milan. I hope to go back this September before my workshop on nearby Lake Garda. I'm working on a large painting right now that still needs a bit more work before I share it, so in the meantime I thought I'd share one of my favorites done awhile ago. I have this one hanging in my own house. Reminds me of happy days spent on Lake Maggiore in Italy. 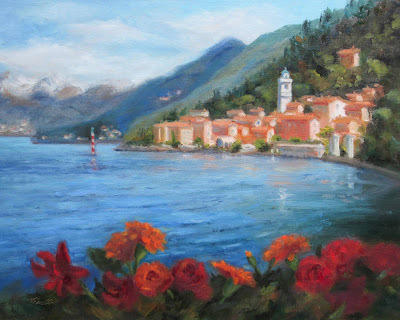 If you have always wanted to go to Italy, I am organizing another painting trip to Lake Garda in Northern Italy this September. for more details click here. In the meantime, I thought I'd share a bit of inspiration for the day from artist Robert Henri to remind us what art is all about. Haven't been posting as frequently lately since I have been working on this painting for a few weeks. 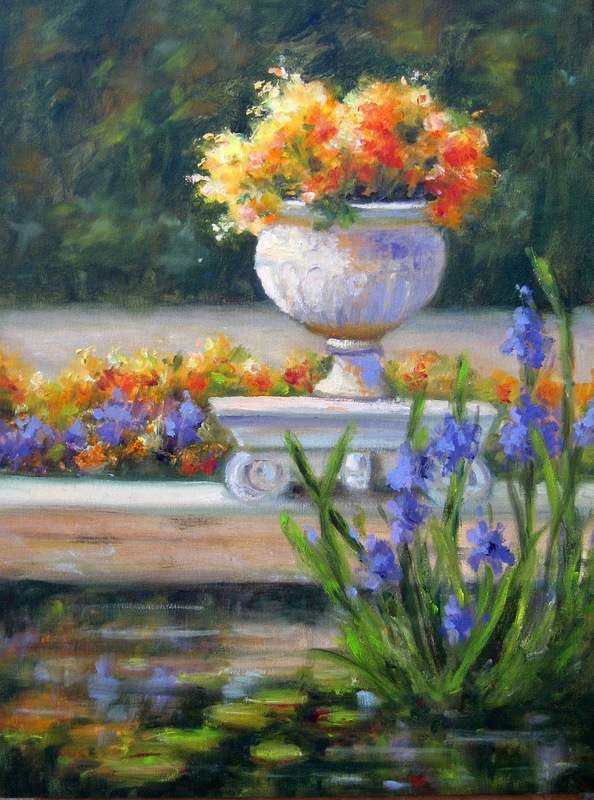 I tend to prefer to do one painting and bring it to completion before starting another. I know some artists prefer to have lots of canvases in various stages of development going at the same time, and can g back and forth but being focused and totally immersed in one at a time seems to suit me better.